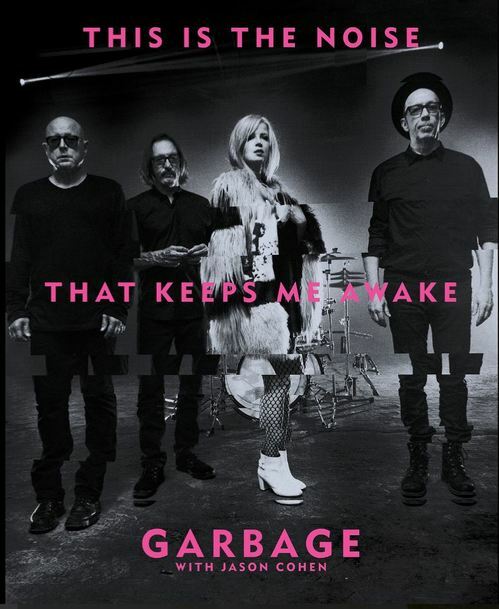 Fans of 90s-era alternative rock will rejoice at a new autobiography by the band Garbage. Published by Akashic Books earlier this month, This Is the Noise That Keeps Me Awake was co-authored by the band’s original four members--Shirley Manson, Butch Vig, Duke Erikson, and Steve Marker--along with journalist Jason Cohen, who first profiled the group for Rolling Stone on the eve of their debut album’s release in 1995. The helfy folio-sized photo-montage retrospective was three years in the making. While chronicling the band’s meteoric rise to fame, This Is the Noise That Keeps Me Awake also includes cocktail recipes, favorite songs, surprising personal anecdotes, and every gig Garbage ever played. An examination of the drastic changes within the music industry over the past two decades is unexpectedly engaging and offers a nuanced insider’s perspective on the turn to digital music consumption. Formed in Madison, Wisconsin, Garbage’s debut eponymous album sold four million copies worldwide and went double platinum in the United States. Lead vocalist Shirley Manson came to epitomize the alt-rock angry feminist movement of the 1990s, and remains a beacon for a new generation of performers and listeners. Band memorabilia is still doing brisk business, too: an autographed VHS (yes, you read that right) tape cover is currently available at Hollywood Memorabilia for $272.99. The book’s July 4 release coincided with band’s latest tour, crisscrossing North America along with 80s punk favorite, Blondie. The book and the tour prove that you’re never too old to keep on rockin’. This Is the Noise That Keeps Me Awake, by Garbage and Jason Cohen; Akashic Books, $39.95, 208 pages. Photo credit: Autumn de Wilde. Reproduced with permission from Akashic Books. Fans of 90s-era alternative rock will rejoice at a new autobiography by the band Garbage. Published by Akashic Books earlier this month, This Is the Noise That Keeps Me Awake was co-authored by the band's original four members--Shirley Manson, Butch Vig, Duke Erikson, and Steve Marker--along with journalist Jason Cohen, who first profiled the group for Rolling Stone on the eve of their debut album's release in 1995. The helfy folio-sized photo-montage retrospective was three years in the making. While chronicling the band's meteoric rise to fame, This Is the Noise That Keeps Me Awake also includes cocktail recipes, favorite songs, surprising personal anecdotes, and every gig Garbage ever played. An examination of the drastic changes within the music industry over the past two decades is unexpectedly engaging and offers a nuanced insider's perspective on the turn to digital music consumption. The trade edition hardcover is impressive; matte art paper tinted hot pink on the edges and would delight any Garbage fan, but for the truly devoted with $125 to burn, Akashic is offering a limited edition version housed in a clamshell box accompanied by a vinyl record that includes six live, previously unreleased recordings of Garbage hits like "Beloved Freak" and "Cup of Coffee." Formed in Madison, Wisconsin, Garbage's debut eponymous album sold four million copies worldwide and went double platinum in the United States. Lead vocalist Shirley Manson came to epitomize the alt-rock angry feminist movement of the 1990s, and remains a beacon for a new generation of performers and listeners. The book's July 4 release coincided with band's latest tour, crisscrossing North America along with 80s punk favorite, Blondie. The book and the tour prove that you're never too old to keep on rockin'.